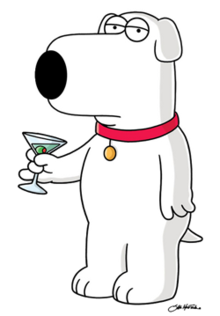 Brian Griffin, the martini-drinking anthropomorphic dog from the animated series Family Guy, has been killed off. In the episode which aired on November 24, Brian was hit by a car and subsequently died from his injuries. In the same episode (entitled Life of Brian), Stewie Griffin had dismantled his oft-used time machine, and was unable to reconstruct it to go back and save Brian. A month after Brian's funeral, the family get a new dog, Vinny, voiced by Tony Sirico. Well, this was an idea that got pitched in the writers room and it sort of caught fire, and we thought it could be a fun way to shake things up. As soon as this idea came up, we started talking about what the next couple episodes could be and we got very excited about the way this change will affect the family dynamics and the characters. Update: Some fans were, predictably, not happy with Brian's fate. The effectiveness of online petitions is debatable, but one has been set calling for Brian's return. As of now (Nov 26), it has just under 42,000 signatures. Update2: Brian was resurrected in the December 15 episode, entitled Christmas Guy. Stewie encounters a younger time-travelling version of himself, from before the point he destroyed the time machine, and he borrows the machine to go back and push Brian out of the way of the car that would have killed him. Stewie just has enough time to explain the situation to Brian before he fades from existence, the timeline having been changed. The episode ends on Christmas Day with Brian alive and Stewie unaware of Brian having died. Note: I five starred this because good reporting (and if I was incorrect before, you're definitely at a hundred now, Higgs); I don't care one way or another about the character. That being said, this reminds me of the time South Park tried to kill off Kenny permanently (or basically any time any semi-major comic book character is "killed"); bets on how long before this gets retconned (especially if Vinny becomes some sort of "Scrappy" type character, though apparently Bryan kind of was that for a lot of people already)? Seriously, it's Family Guy; if they want to just bring him back with absolutely no explanation in a season or two, that wouldn't be out of character. Out of curiosity I watched this ep, though I haven't watched the show regularly since the first season. It seemed bizarrly over-dramatic and morbid to the point that the story was just really cheesy. It just didn't feel like a Family Guy episode at all to me. More like a nightmare from which a die-hard Family Guy fan might wake up in a cold sweat. I get the feeling the writers are getting desperate to keep the show fresh an interesting. I've already seen complaints about the decision to kill off Brian. I'm sure it's inevitable that a lot of viewers will regard this as a jump-the-shark episode. Sounds like killing off Brian will be big controversy as when For Bettor or For Worst killed off Farley. Personally I do not care since I stopped watching the show years ago. P.S have the writers taken a page from Waking Dead. Lot's of new family guy episodes are not that funny compared to the classics. SOME new ones were, like the "News of The World" bit for example, and I liked some of the stuff Stewie did with Brian such as going back in time, etc. While the new ones often feel dull most of the time to me, I do think that this however was a really dumb move, if it was a new voice acting issue, couldn't they just still keep Brian and replace the voice actor? What a shame.. I mean Brian Griffin I'm pretty sure was the most classic anthropomorphic to have as some comedy. I can still feel that all the way from the start.. It wasn't a voice acting issue...the same actor (and show's creator) is still on the show voicing Peter and Stewie. It was pretty much just done on the whim of the writers. It's sad to see such a complex character go. Brian had an extensive personality, going from chasing cars one minute to having rational discourse the next. I especially loved the fact that he was an atheist in a time when religious fundamentalism was (and still is) going haywire here in the US. He's the one character I could identify with the most. Truly a multifaceted K9.